The country’s northeast region is known for contrasting weather conditions that range from violent storms to relatively mild, sunny days. Subsequently, the installation of energy efficient windows that helps to bring natural light and beauty indoors is a priority for many home and business owners in the region. Several window installers and contractors in Washington County, Rhode Island are ready to help those who are considering this type of home improvement investment. Custom Built Window and Door Systems is a family owned business that manufactures and installs vinyl replacement windows, porch enclosures, and storm windows. Customers can choose from a variety of custom window styles that include double hung, sliding, casement, and picture windows. The company’s reputation for quality products and service spans over four decades. The technicians at Custom Built Window & Door install their own brand of vinyl replacement and storm windows. The Enegex and Polar Guard series are their vinyl replacement window models, and Point 1 and Custom 100 are their storm window selections. Custom Built Window & Door services all of Rhode Island, Massachusetts, and Connecticut. The operators of Eco View Windows and Doors manufacture and install quality, energy efficient windows and doors that meet the unique needs of their clients. 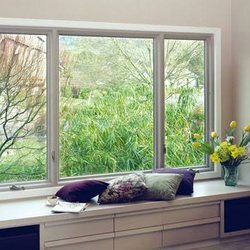 These custom windows are also manufactured to produce the least impact on the environment. For example, Eco View’s vinyl replacement windows are made from 100 percent recyclable vinyl, and its production practices result in near zero emissions. Eco View installs its own brand of custom replacement windows that include styles like bow, bay, picture, casement, and awning windows. Eco View dealerships are located across the country. For example, cities in Alabama, Rhode Island, Illinois, Florida, Texas, and California are served by the company. Lux Renovations, LLC. manufactures and installs windows that are designed to reduce energy consumption, increase home value and increase the lifespan of residential heating and cooling systems. Additionally, the company offers a variety of financing options that are especially useful for households that require emergency window replacement projects. Lux Renovations, LLC. custom builds and installs its own Solace brand windows. Lux Renovations, LLC. services areas in Southern New Hampshire, Massachusetts, Maine, and Rhode Island. The technicians at StormTite Home Improvement have been installing and repairing windows, doors, siding and roofing since 1969. The company features windows that are energy efficient and backed by a lifetime warranty that protects clients against nearly any kind of window manufacturing or material defect. StormTite Home Improvement installs Comfort Plus Windows, Majesty Custom Wood Windows, Classic Acoustic, and Vigilance Impact Resistant Windows by Harvey Industries. StormTite Home Improvement serves cities throughout Rhode Island and Massachusetts. Rhode Island Home Improvement is a leading regional home renovation company that has been replacing and repairing windows, kitchen cabinetry, siding and roofing for over sixty years. The company specializes in window replacements that are durable, easy to maintain, and energy efficient. Rhode Island Home Improvement uses its own brand of Protec Windows for its replacement window installations. Rhode Island Home Improvement serves Rhode Island cities like Providence, Warwick, Johnston, Cranston, and Cumberland. The Window Source specializes in manufacturing and installing windows that are energy efficient and look great too. Their custom windows are made with leading edge technology like Warm Edge Spacer and Low E argon filled window glass to provide the greatest energy efficiency. Customers benefit from product and installation warranties as well as the company’s written best price guarantee. The Window Source installs several models of its own window brand for bow, bay, double hung, sliding, and garden windows. The Window Source boasts 35 locations across the country, and they have showrooms that serve cities in Rhode Island, Massachusetts, and New Hampshire. TJ Quality Windows is a national network of window repair and installation experts. They excel at matching customers with skilled contractors who provide quality products, specialized service, and flexible schedule options. The contracting companies that are a part of the TJ Quality Windows network install Reinco windows. TJ Quality Windows serves all Rhode Island cities that include Little Compton, Exeter, Cranston, Bristol, Providence, Middletown, and Barrington. Venture Window Inc. is owned and operated by professionals with over 30 years of experience installing windows for residential and commercial customers. The company specializes in the replacement of vinyl, historic, and storm windows. 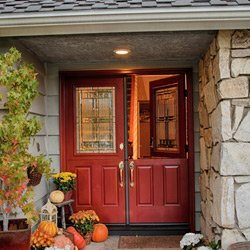 Other services provided by Venture Windows include the repair and replacement of entry doors, siding, and roofing. Venture Window Inc. installs Andersen, Certainteed, Slocomb, Crystal, and Plygem Window brands. Venture Window Inc. serves all of Rhode Island. Windor Inc. is a family owned and operated window and door installation company that has been in business since 1975. Its trained, expert installers help to differentiate the company from its competitors. For example, all Windor project supervisors are experienced carpenters as well as skilled window installers. Windor, Inc. installs Slocomb and Soft Lite Window brands. Windor, Inc. serves all of Rhode Island. Window World is a recognized national leader in vinyl window replacement projects. It is known for its exemplary service perks like free in home demonstrations as well as quality products that have earned the Good Housekeeping Seal and are backed by lifetime warranties. Window World manufactures, customizes and installs its own brand of window for each of its window replacement projects. Window World of Rhode Island serves the cities of Bristol, East Providence, Cumberland, Newport, Central Falls, North Kingstown, Barrington. Washington County is located in the southern portion of Rhode Island, and its population in 2014 was estimated to be above 126,000 people. The county’s 18th century origins are responsible for its name. After the displacement of the Narragansett tribe of the Algonquin people, the area was called King’s County in honor of the British royal crown in 1729. The county was renamed for the first United States president after the Revolutionary War. Currently, Washington County’s residents enjoy a relatively high degree of economic prosperity when compared to the rest of the state. For example, the 2013 median household income in Washington County was $72,138, and the median household income for the state was $56,361. Also, the county’s homeownership rate was higher than the corresponding state rate by 13.3 percentage points according to census figures taken in 2013. Some Washington County cities include Charlestown, Exeter, Richmond, Narragansett and Westerly. Washington County is known for its picturesque historic neighborhoods that are set along coastal areas as well as its national wildlife refuges.